History nerds rejoice! As Curbed reported yesterday, the NYCityMap has just added GMaps-style high-res aerial photography . . . from 1924! 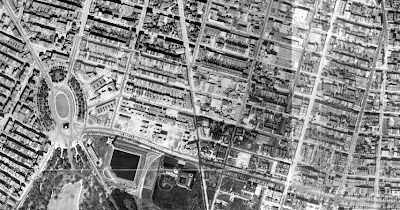 Franklin Avenue itself looks remarkably similar from the air, save a few new buildings here and there, but with a wider view you can observe some gone-forever sites, including the Brooklyn Reservoir (pictured above, at what is now Mt. 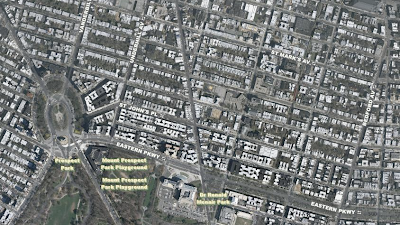 Prospect Park) and Ebbets Field. Other spaces are empty, including the entire block that became Prospect Heights High School and the later site of the Brooklyn Botanic Garden. I haven't finished exploring the neighborhood of 1924 block by block, but that's what weekends are for! 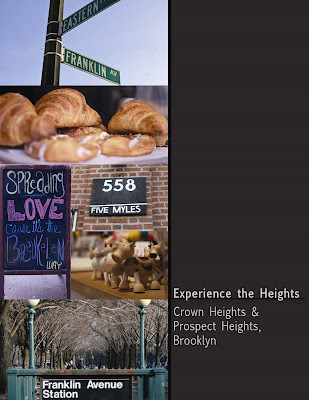 Local busineses are coming together with Brooklyn-based MASAI Marketing to produce "Experience the Heights," a community event to be held Saturday, February 6 at Five Myles Gallery on St. John's Place. Organizers say "The event will focus on local businesses and talent in the Crown Heights and Prospect Heights neighborhoods. We are highlighting the growth and eclectic aspects of both neighborhoods. Our objective is to help garner additional visibility for the participating businesses." Wine bars, art galleries, and toy boutiques . . .
to friendly cafes where hospitality is common ground. The latest shopping, food, and art in Crown Heights & Prospect Heights. Receive 10% off any purchase when you visit the businesses below and mention "Experience the Heights"
Join us at Five Myles Gallery for a live band performance, works by local artists, wine, and a taste of what the neighborhood's restaurants have to offer. The Breukelen Coffee House got a nice mention in the Daily News today, and the Crown Heights literary scene got a little notice in the form of an NYMag profile of semi-local author Joshua Ferris. - Referencing a few hours spent picking up trash in the same breath as MLK's support of striking black sanitation workers (who had been denied equal treatment and pay by the city of Memphis) was idiotic. I was searching for a hook, and a chance to mention a little bit of history, but I ended up equating the two. - My initial report that the arrests at 695 Franklin were "drug-related" was based on two sources. First, I've seen deals go down on that corner before, as have several neighbors with whom I've discussed this particular apartment block, including longtime residents. Secondly, the team of officers making the arrests appeared to be a special unit, not a precinct-based team, which a former officer and a pair of beat cops later confirmed was "almost certainly" the narcotics unit. By reporting the event as a "drug-related raid," I didn't intend to presume the innocence or guilt of those in handcuffs or to comment on the conduct of the police. Were the rights of the accused respected? Was taking the door with a sledgehammer necessary? Were any narcotics found in the apartment? I can't tell you. All I can say is that the NYPD narcotics team was involved in a raid, which, to me, seems enough to describe it as "drug related." However, my post wasn't a pure police-blotter-style report, because I used the second paragraph to relate my interaction with the gathered crowd. I highlighted the race of those in handcuffs, and the fact that I was the only "cracker" around, because it condensed the racial tension that undoubtedly exists on Franklin into a quick, easily-related anecdote, one that drew more comments than any other post I've written. I didn't offer much in the way of analysis myself because I was curious to gather responses, but I will now. The folks trying to bring a Slope-style food co-op to Crown Heights, Prospect Lefferts Gardens, and Flatbush are having a general meeting tomorrow night, January 21st, at the Maple Street School (off the Parkside stop on the B-Q at 21 Lincoln Rd) at 7pm. The Lefferts Farm Food Cooperative is dreaming big--one organizer estimates that putting together a grocery store of the caliber they want could cost upwards of $1 million once everything is factored in--but their plan is getting attention in the blogosphere and earning chatter on Brooklynian. If you'd like to see something like this in the neighborhood, check out tomorrow's meeting. Also, if you have skills of the web-design or media-relations variety, consider attending their Communications Committee meeting on the 28th (more information available on their website). The site of yesterday's raid. I didn't see the raid reported anywhere, but apparently that's not surprising. My friend who used to be on the force said it sounded like a fairly typical narcotics raid based on my description of it, something he called "pretty standard" and "not really something the papers would cover." From what he told me, "snitching" or tips only tangentially result in raids--the narcotics unit only goes in if they successfully purchase from the suspects, usually more than once. I was planning to ask one of the foot patrols in the neighborhood about it, but they weren't out last night or this morning when I was on the avenue, and the 77th Precinct didn't have any information when I called to ask (I don't think they typically discuss something like this, particularly if the investigation is ongoing, which it might be, and they also may not have been involved if the raid was conducted by the narcotics unit). As for blogging it, I don't post every time I see the guys dealing weed up around Sterling/St. John's/Lincoln on Franklin, but a raid seems newsworthy if you live on the street. Sure, it's nothing like it was if you talk to the long-time residents--a US Marshals notice adorned the old Melo Grocery at St. Mark's and Franklin when I first got here, a remnant of federal raids on cocaine dealers in the 1980s--but police with riot shields and sledgehammers are out-of-the-ordinary for me. Update to the Update: I spoke with a pair of officers on the beat on the way home, and while they didn't know anything about the specifics of the event, they said it was almost certainly a narcotics raid. They also pointed out that the 77th Precinct and other NYPD units have been paying special attention to Franklin over the last few months, in the form beefed-up foot patrols, anti-drug work, and the Skywatch's continued presence. Sometime between 10:25 and 10:50 AM this morning, a team of at least five NYPD officers parked unmarked vans in front of 695 Franklin Avenue (between Park and Prospect) and stormed the apartment building in what appeared to be a drug-related raid. When this blogger went by at 10:50--I had passed earlier around 10:25 and all appeared quiet--two individuals were being led away in handcuffs, a middle-aged African-American woman and a middle-aged African-American man. All of the officers wore kevlar vests, and one was replacing shields and other riot/SWAT-type gear in the back of one of the vans. A small crowd had gathered at a distance, and one observer remaked to a friend that the police "had gone in hard . . . with a sledgehammer." There was no readily apparent evidence of a struggle, though the officers were clearly prepared for one. I would have stuck around to learn more, but the mood nearby was not, to say the least, friendly. As I passed, slowing to look over my shoulder and debating whether to snap a photo, one woman shouted "Someone's been snitching! These crackers have been snitching!" Being the only person who fit that description in attendance, I made my exit. Hopefully I'll have more on whatever this raid was about later in the day. Without these guys, things can get weird. If you've got the day off this Monday and you'd like to give back, I've come across two great options already, and I'll post more throughout the weekend as I discover them. Also, remember to get your non-perishable items to the Pana Store by early this afternoon for Haiti earthquake relief (thanks to Liz for the tip). Volunteers who can cut, sew, fold fabric, pack boxes and enjoy working together should come to our studio. THE STUDIO WILL HAVE PERPETUAL SEWING MACHINES AVAILABLE AFTER THE DAY OF SERVICE FOR CONTINUAL SEWING OF CLOTHING FOR SURVIVORS OF THE EARTHQUAKE. In honor of MLK Day of Service I'm gathering a group for another Clean Up Crown Hts event on Monday, Jan 18. If you are interested, please sign up by emailing me at jeslane@hotmail.com. Let's meet at noon in front of Bristen's, 751 Franklin Ave (between St Johns Pl & Sterling Pl). 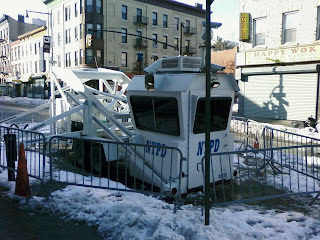 We'll work for about two hours, and clean up as much as we can between Eastern Parkway to Atlantic and Classon to Nostrand. And yeah, the weather is supposed to cooperate this year. Yesterday's earthquake in Haiti lists as "world news" on major news sites, but for many residents of Brooklyn, the event was both international disaster and personal catastrophe. 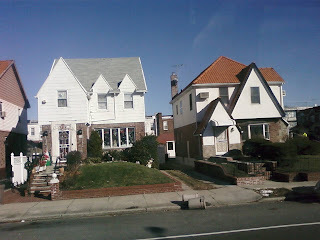 Brooklyn houses the largest Haitian community in the United States--official numbers assert that 88,763 residents are Haitian or of Haitian descent, but given chronic under-reporting and under-counting in immigrant communities, the number is likely well over 100,000--and is a center of Haitian-American culture, the teenage home of MacArthur "genius" fellow Edwidge Danticat among others. Disasters like yesterday's often leave me dumbstruck, incapable of processing the magnitude of the human suffering they entail enough to even talk about it, much less take constructive action. 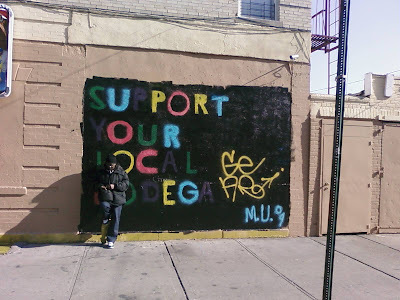 However, Nostrand Park's Ferentz Lafargue has penned a thoughtful report for Next American City that offers some hope in the midst of the destruction and offers several channels for constructive giving. Please give it a read. The former mSnap storefront on Franklin and Park is being reinvented as a community arts space called LaunchPad. They've set up a page to raise funds for an opening in Spring 2010 on Kickstarter, which you can access here (take a look at the video). If you like this idea as much as I do, you can become a sponsor and help bring this great idea to the Avenue. LaunchPad: A future homebase for creative minds and curious spirits; a mixed use community space in New York City where people can rally together, trigger ideas, launch projects, and have tons of fun. Bartertown and marketplace: Trade and sell artwork, services, homemade treats, magic potions, unwanted Christmas gifts, whatever. Bring paintings, photos, haircutting skills, vegetables from your garden, furniture, brownies, anything and everything. Rotating art exhibits: Artwork on the walls, floor, and ceiling. Display, admire, trade, buy. Movie screenings: New ones and old ones, projected on the wall. Comfy couches and fresh popcorn! In addition to hosting and encouraging artists and art lovers, LaunchPad will also sponsor a variety of art projects. 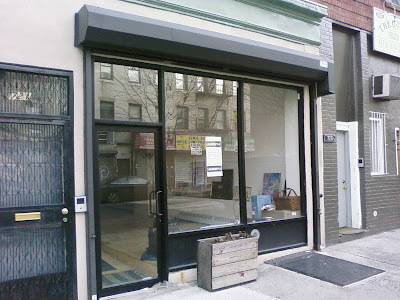 The venue for LaunchPad is an 800 square foot Brooklyn storefront, with a 1000 square foot backyard. It's located on Franklin Avenue near Park Place in a beautiful, historic, quickly growing neighborhood; a few short blocks from the 2,3,4,5,C,E,S subways. The place has a glowing soul and huge ambitions. It's literally a blank canvas, just waiting to be transformed into a creative haven where people with similar (and diverse!) interests can hang out and inspire each other." East New York: Shepherd and Belmont. Admittedly, poetry was last month, but this month features short stories and I'm not sure I'm up to that just yet. See you there at 8pm for books and booze. It's hardly news to write that Brooklyn has a way of attracting literary luminaries, but that didn't stop the Times from putting together a nice little book-lover's tour of Fort Greene this weekend. Spike Lee's childhood home does perpetual battle with Park Slope and Brooklyn Heights for the coveted "most authors per capita" neighborhood title, but our local salonista, Penina Roth, wants to put Crown Heights in the mix. Having built the Franklin Park Reading Series into a staple event of the local cultural calendar, Ms. Roth is now making it her mission "to showcase local and emerging writers and bring in established headliners to inspire our neighborhood's growing literary community." To that end, this Monday's Short Fiction reading will feature two Crown Heights authors, as well as a third from neighboring Bed-Stuy. The complete lineup, copied from the event's facebook page, is below, but for now, make sure you make it to Franklin Park this Monday, January 11th, at 8pm. Also, one of the stars of the December Reading Series, D.W. Lichtenberg, will be reading across the river at Think Coffee in Noho with Brooklyn writer Andrew Lane Palmer on Wednesday, January 13th. If you liked his stuff before, go support him again! We're celebrating the new year and the revival of the short story by showcasing the work of three emerging local writers -- COURTNEY ELIZABETH MAUK, ALEXIOS MOORE, and VICTORIA CHO. HANNAH TINTI, one of today's most celebrated short story writers -- and a leading booster of the form -- will be sharing her own work and lending inspiration. And JAKE GOLDMAN, co-host of the acclaimed storytelling series True Tales of College, will tell his own absorbing tales. HANNAH TINTI grew up in Salem, Massachusetts, and is co-founder and editor-in-chief of One Story magazine. Her short story collection, Animal Crackers, has sold in sixteen countries and was a runner-up for the PEN/Hemingway award. Her first novel, The Good Thief, was a New York Times Notable Book of the Year in 2008, recipient of the American Library Association’s Alex Award and winner of the John Sargent Sr. First Novel Prize. Hannah also recently won the 2009 PEN/Nora Magid award for her editorial work at One Story. COURTNEY ELIZABETH MAUK has an MFA in Fiction from Columbia University. Her work has appeared in The Literary Review, Forge Journal, PANK, Word Riot, and the anthology Gravity Fiction. She has had two short stories nominated for this year's Pushcart Prize. She lives in Crown Heights and teaches writing at College of Staten Island. She currently is at work on a novel. ALEXIOS MOORE writes real stories that aren't true and true stories that aren't real. His non-fiction stories have been published in Pindelyboz, H.O.W., Post Road, and he is publishing his first short story in the upcoming issue of The Dos Passos Review. Alexios recently completed a residency with the Lower Manhattan Cultural Council and is a contributing editor to H.O.W. Journal. He teaches writing at Eugene Lang College and the College of New Rochelle, and makes his home in Bedford-Stuyvesent. VICTORIA CHO writes articles for social and environmental organizations, as well as essays and short fiction. Born in Charlottesville, Virginia, Victoria fled the South and received a Bachelor's in Film from Boston University. She worked on various independent film projects in New York, then left the business to write and travel. She has recently returned from teaching English in Thailand. In addition to the social change blogs Take Part, EcoHearth and All Day Buffet, her writing has appeared online in the literary magazines Escape Into Life, Bartleby Snopes and Tragic Pens. 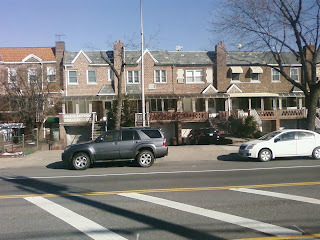 She has lived in Crown Heights since June 2009. JAKE GOLDMAN, co-host of the storytelling series True Tales of College, is a writer and performer living in Queens. His work has been seen in The NY Press, CBS News and the Huffington Post. I'm pretty sure this is frowned upon, but it spiced up my morning commute. 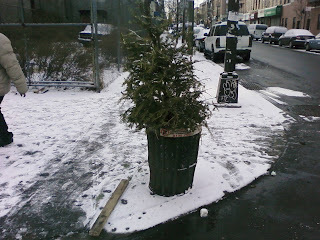 If you do have an old xmas tree kicking around, put it out on the street unbagged and without any tinsel so the NYC Department of Sanitation can mulch it for use in the parks. My job used to take me all over the borough, and my wanderings between appointments spawned this blog. I don't get out of the office nearly as much anymore, but every now and then I escape for an afternoon and get to admire the remarkable diversity of Brooklyn. This afternoon's project took me to Gerritsen Beach. Named for Wolphert Gerretse, a Dutchman who settled in the area in the mid-17th century and who built a mill that survived until 1931, Gerritsen Beach has a decidedly small-town feel to it (to the very untrained observer's eye, of course) that comes across in the local website and the website's memory board (there are some great family histories posted here, and a fabulous collection of photos . . . Re-Brooklyn, take note). The area's tight streets, small lots, and waterside nature have led to comparisons to a New England fishing village, but to my mind, it's more like the rest of Brooklyn and parts of Queens (or London, for that matter), a little old town center that was built out in the interwar and postwar periods and now looks and feels somewhere between suburb and city. The area, which is close enough to Sheepshead Bay to warrant coverage on Sheepshead Bites, almost got a subway line through the extension of the Nostrand Avenue IRT (2 and 5 trains) in 1951, but the plan was quashed by the legendary Robert Moses (whose reputation has been in hot dispute recently after decades of shame on account of Robert Caro's magnum opus) and the only NYC Transit that serves the area is a pair of bus lines, the B31 and the BM 4. This lack of mass transit and its attendant high-density development are probably a contributing factor to Gerritsen's suburban feel--parking lots and shopping centers abound, and few buildings rise above three stories. Speaking more broadly, the trip was a reminder that when I and most everyone I know talk about Brooklyn, we're talking about the borough north of Prospect Park South and west of Broadway Junction. A full half the borough more closely resembles Gerritsen than Crown Heights, and yet to me, it felt like I'd almost left NYC completely (until I looked north on Nostrand and caught a glimpse of the Citicorp Center glinting in the distance). It also brought home the reality that the city's infrastructure decisions (in this case, building access to the Belt Parkway rather than extending the subway) have a profound impact on the character of a neighborhood. Final Robert Moses note: You can read Moses's response to The Power Broker here, and Caro's response to the response here. Ah, to be in NYC in the 1970s bickering over responsibility for the city's decline! 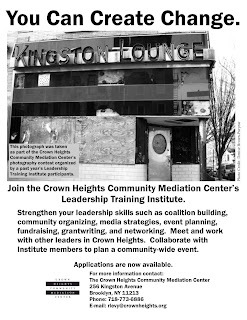 The Crown Heights Community Mediation Center is accepting final applications for their upcoming Leadership Training Institute. You can find the application on their website (linked above). If you've got 25 hours to spare this spring, it sounds like a spectacular way to develop your leadership and community organizing skills, meet some awesome people, and make a difference in Crown Heights. Two local institutions are ringing in 2010 with makeovers. 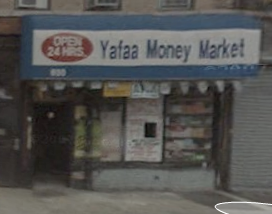 The owners of Yafaa Money Market, one of several delis/bodegas/grocery stores on Franklin, have completely gutted their store as part of a renovation. The location, at 690 Franklin just south of Prospect, will remain a grocery store. 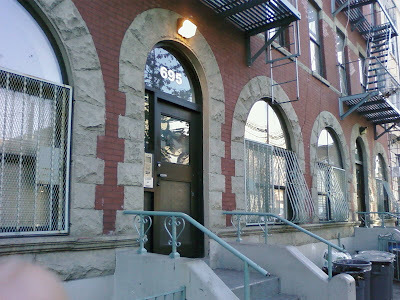 Meanwhile, Nostrand Park is undergoing a virtual renovation and relocating their excellent local blog to a new site. - At 639 Eastern Parkway, a few avenues east, tenants took to the streets today to protest their landlord's negligence. Many of the building's residents have been without heat or hot water since the new year, when a pipe burst, flooding an apartment. The unluckiest tenants are without any running water, and one apartment has not been cleared of flood waters. - The NYTimes' "Neediest Cases" fund-raising series ran an article about a bipolar woman who spent years in Crown Heights channeling her energies into sewing and crocheting. Her use of the hobby to cope with her illness called to mind the work of Sue Rock, who uses textile training and production to serve victims of domestic violence at her Bergen Street storefront. In a move that's sure to be a hit with the domesticated animals of Franklin Avenue and their doting owners, Fisher's and Pulp & Bean owner Tony Fisher is planning to open at least one, and maybe two, pet supply stores on Franklin Avenue. Fisher has had a busy fall with the opening of his new coffee shop, but after a much-needed January vacation, he plans to jump back into the always-improving retail scene, first at a space he owns south of Eastern Parkway (near his other family supermarket, the Pioneer) and then potentially at a location north of Eastern. He mentioned that he'd spoken with a few landlords, including the owners of the space next to Bristen's (pictured above). Based entirely on anecdotal evidence, I'd say there's demand for the business--I see plenty of dogs around on leashes and cat owners have made their presence felt on Brooklynian recently. The new mascot of I Love Franklin Ave will certainly be pleased.